The Albany Rural Cemetery can be a beautiful spot for a walk. With the arrival of spring, we asked Paula Lemire, who's studying the history of Albany's august, park-like cemetery for Albany Rural - Beyond The Graves, to share some of her favorite monuments there. If one spends enough time walking and exploring the Albany Rural Cemetery's 467 acres, it becomes very difficult to pick a favorite monument. With more than 200 numbered sections and thousands of graves ranging from crumbling sandstone slabs to larger-than-life statues, I fall in love with a new favorite on every visit. With that said, here are some of my favorites -- at least, until the next walk. This headstone caught my eye on my first visit to the Rural Cemetery years ago. At the time, someone had left a little pot of tiny pansies at its base. Another time, I found marigolds planted there. 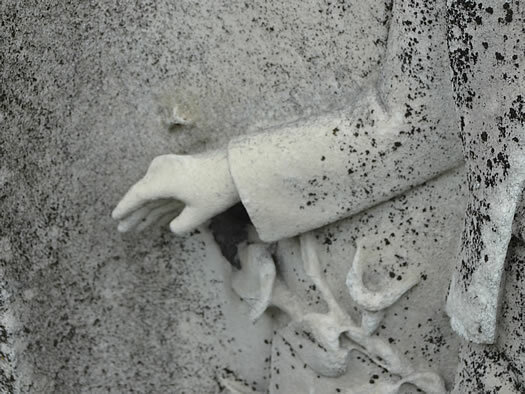 The weathered white marble shows a well-dressed young boy, an open book in one hand, pausing beside a tree stump which is wrapped in morning glory vines (the stump and flowers are both symbols of an early death). There is an old story that this eleven-year-old boy was fatally stung by a bee as he walked home from school and that his carved likeness is looking down at the bee as it comes to rest on his hand. The carving is (or was before the elements eroded some of the monument's finer details) actually a butterfly, a symbol of rebirth. Contrary to the story, though, the burial records show that eleven-year-old George M. Shortiss died of typhus on February 1, 1861. Georgie was the only son of George Shortiss and his wife, the former Mary Montheath. A native of England, the elder George Shortiss was a dealer in baking soda with a shop at 43 Quay Street and a home at 259 State Street. Part of the charm of this vault is its location. It's not visible from any of the main roads and it can only be reached by secluded paths through the ravine that divides the South and Middle Ridges. It overlooks a little stone bridge and the drained remains of Consecration Lake, where fountains once sparkled and swans imported from Europe glided around. The site wasn't always quite so secluded, though. When the vault was constructed, it overlooked one of the first portions of The Tour, a scenic route for visitors to follow through the cemetery grounds. It was a highly visible section and considered prime real estate. An engraving of the vault was even included in Churchill's Guide Through The Albany Rural Cemetery, the first handbook for visitors and prospective lot owners. 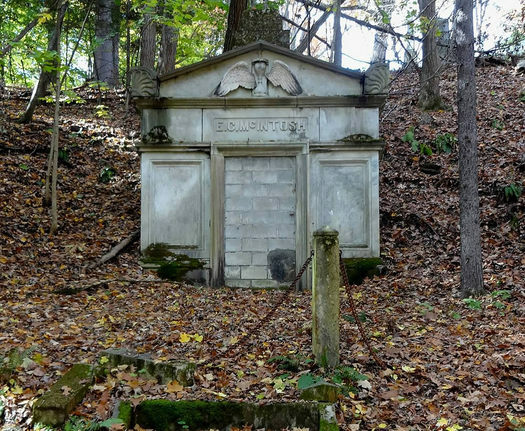 Built partially into the hillside, the McIntosh vault is now missing the statue which stood atop and the door is sealed with masonry blocks. Above the door, a dramatic winged hourglass illustrates the ancient saying "Time Flies." Though the vault is quite large, it contains only two interments: Ezekiel C. McIntosh and his first wife, Delia B. Tisdale. A native of Troy, McIntosh began his business career as a merchant of china, crockery, and lamps. With money from his mercantile business, he invested in real estate and, more importantly, in the new railroad industry along with Erastus Corning and Russell Sage. He was an investor in the Mohawk & Hudson Railroad and, later, president of the Schenectady and Troy Railroad. Delia McIntosh passed away in 1826 after only five years of marriage. Eighteen years later, Ezekiel married Caroline Carmichael and purchased Schuyler Mansion as a primary residence. Ezekiel McIntosh died on May 23, 1855 at the age of 49. Three years later, his wealthy widow (who was described as possessing "a cheerful temperament and a cultivated mind") married former President Millard Fillmore in the same mansion parlor where, in 1780, Alexander Hamilton had married Elizabeth Schuyler. This old tomb even made a cameo appearance in a television advertisement for the iconic Lark Street nightspot 288. Unlike the McIntosh crypt, the Parsons monument is easy to find at the junction of Linden and Cypress Avenues. It's a towering cross of pale stone; at the base, a graceful bronze angel stands with open arms. The monument was one of two collaborations between famed Albany architect Marcus T. Reynolds and Oscar Lenz, a protÃ©gÃ© of Augustus Saint-Gaudens. Reynolds created many works for the Rural Cemetery, including the main gate on Route 32, the now-vacant Superintendent's Cottage, and several monuments. Oscar Lenz was born in Providence, Rhode Island. At twelve, he joined the Rhode Island School of Design, and at 16, he joined the Art Students League in New York City where he attracted the attention of Saint-Gaudens. Working under Saint-Gaudens, Lenz assisted with the plaster models for the famous Diana of The Tower statue which stood atop the second Madison Square Garden. He also worked with Saint-Gaudens on several figures for the original Penn Station. 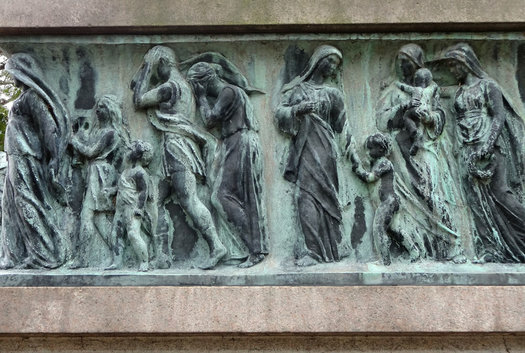 In 1906, Lenz created two bronzes for the monument which Reynolds had designed for the Parsons family plot. The first was the angel which stands framed by an arch. The figure is beautiful and wonderfully detailed, from the delicate pleats of her gown to the olive garland which serves as her sash. Though stains have given the face a mournful look from a distance, the features are refined and the expression gentle when viewed up close. A closer look is absolutely necessary to appreciate the intricate bronze frieze which wraps around the sides and back of the monument. Dozens of figures appear in an ancient funeral procession. There are men and women, infants and the elderly. Some are singing hymns written on scrolls, others carry wreaths. Some seem hopeful, others are bent with grief. 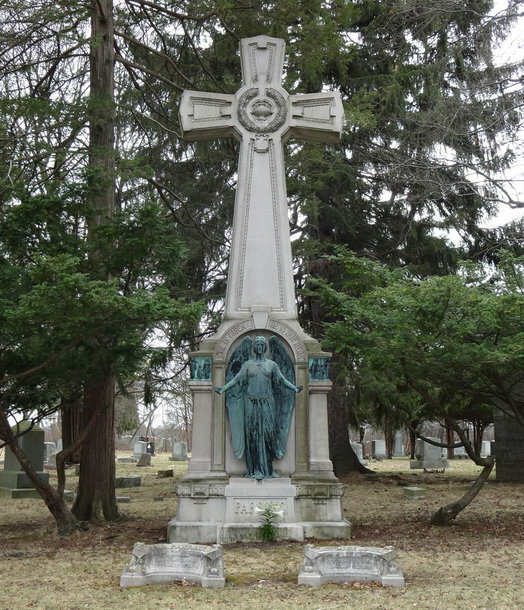 The monument was commissioned by Agnes Chase Parsons, wife of John D. Parsons, Jr., a president of the Albany Trust Company and the National Exchange Bank who was also well-known for his vast collection of autographs and rare books. Parsons was a major benefactor of the old Albany Orphan Asylum which eventually became the Parsons Child and Family Center. John Parsons died at the age of 57 on December 16, 1904. The design for his monument was based on ideas supplied by his wife. Reynolds and Lenz also collaborated on the Hilton mausoleum just down the path from the Parsons angel in 1909. The simple granite vault features a massive bronze relief which depicts an angel offering a poppy to a seated man. Unfortunately, it would be their last collaboration. Oscar Lenz, a young man of great personal charm and wonderful artistic talent, died on June 25, 1912. He was 39 years old. The Weed-Barnes lot stands just across Linden Avenue from the Parsons angel. The centerpiece of the lot is a massive shaft of dark gray granite honoring those two influential Albany publishers, Thurlow Weed and his son-in-law, William Barnes. Clustered around the towering obelisk are smaller matching headstones. Thus will it own thy soft control. And slumber sweetly here at last. Tawasentha was Mohawk for "the place of many dead" and was one of the first proposed names for the Albany Rural Cemetery. (Naming the Cemetery was a surprisingly touchy subject with numerous letters and editorials in the Albany Argus suggesting and debating various names). The name Tawasentha was most commonly applied to the Normanskill valley and was popularized in Longfellow's Song of Hiawatha. Emily Weed was born in 1827 and, in 1849, she married William Barnes who would succeed her father as publisher of the Albany Evening Journal. As the recording secretary of the Albany Army Relief Association during the Civil War, she was active with the famous Albany Army Relief Bazaar (also known as the Sanitary Bazaar) which opened in Academy Park in 1864. That fair raised about $85,000 for the Union war effort and is perhaps best remembered for the auction of the first draft of the Emancipation Proclamation which was sent to Emily by President Lincoln via a family friend, Secretary of State William Henry Seward. That draft is now held by the New York State Library. 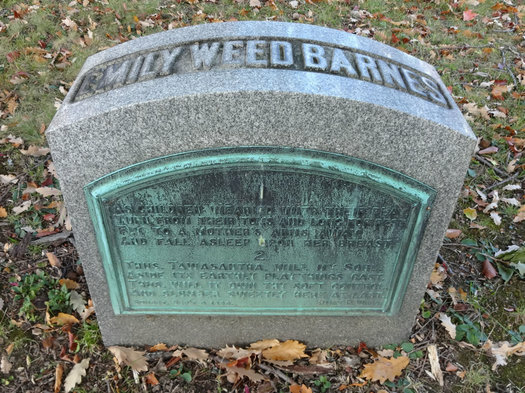 Emily Weed Barnes died on February 10, 1889. The verses she had written 41 years earlier were cast in bronze and affixed to her headstone. I've become quite fond of soul effigies, the winged faces or skulls that were a popular motif on headstones from the late 17th to the early 18th centures. 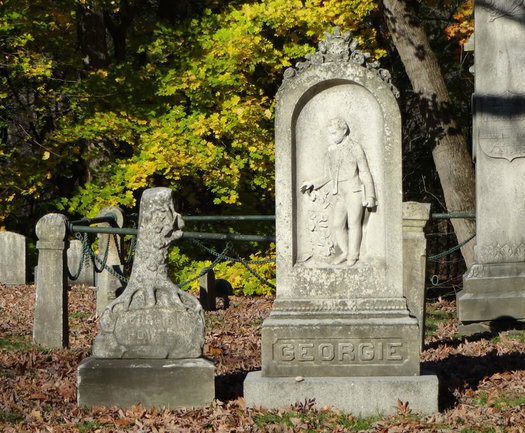 While these designs are much less common in Albany than the Hudson Valley or New England, there are some wonderful examples at the Rural Cemetery. This particular soul effigy lacks the usual wings and is simply surrounded by delicate flowers. The expression is serene and direct. It may even have been intended as a simple portrait of the deceased. The stone is, unfortunately, not signed by the carver. 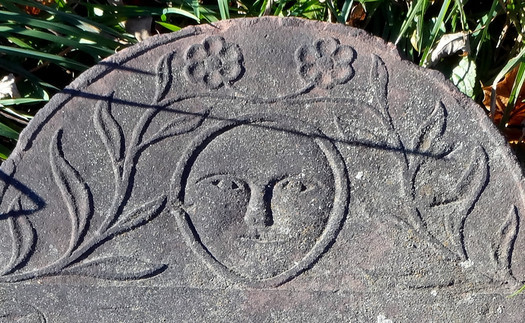 This sandstone marker was originally erected in the Dutch Reformed burial ground that once stretched from Beaver Street to Hudson Avenue just east of South Pearl. Over the years, it was moved several times from the original grave to a vault beneath the Second Reformed Church which was built atop the burial grounds. Eventually, it was placed in the Church Grounds section at the Rural Cemetery alongside scores of old headstones and remains moved from the old State Street Burying Grounds and other old Albany graveyards. The stone marked the grave of Elsie Cuyler, wife of Barent C. Ten Eyck. Born in 1728, she married in 1756. Her husband was a prominent silversmith and Albany alderman. 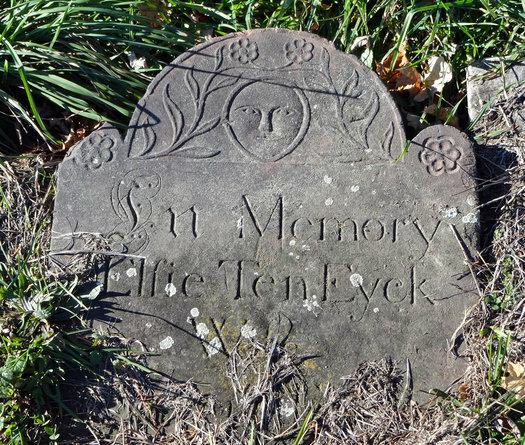 Elsie died on November 27, 1791. She had no children and her headstone was likely commissioned by Barent, who survived her by four years. Paula Lemire is the creator of Albany Rural - Beyond The Graves on Facebook. The McIntosh vault! I've walked around the cemetery a ton and that's one of my favorites. Years ago, I visited walked by it a few weeks in a row and found a turkey nesting down next to the vault. The third week, the turkey was gone, but there were a couple broken turkey eggshells. My other personal favorite is a small marker for one Minnie Cooper. And what about the tombs you can look into and see the stained glass windows with sunlight coming in from the back? Albany Rural Cemetery is the best. This is fantastic. 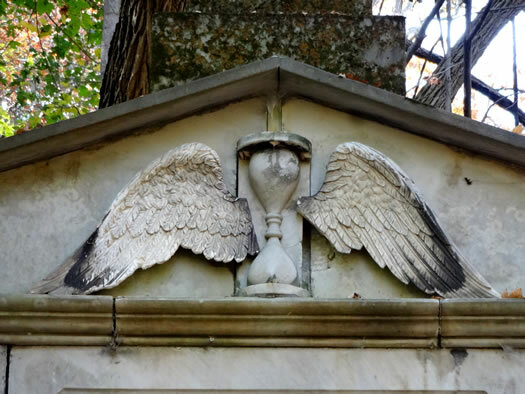 For anyone who wants an excellent day (or weekend) trip to tour another rural cemetery (and really, who doesn't?) I highly recommend a trip east to the Mount Auburn cemetary in Cambridge, MA. The planners of it were the ones who spearheaded the idea of a "rural" (although now most have been enveloped in suburbs) cemetery where people could reflect on the loss of loved ones, in a natural setting. It's also a huge destination for birders so be prepared for lots of binocular users. I just love reading all of the information so rich with the history of Albany and it's people. My grandparents, Franklin M. Bishop and Alice Card Bishop are buried there, along with other relatives. How do I find their graves? I haven't been there since I was a child and I'm 74. My parents used to go every year and plant flowers. Albany Rural Cemetery has a business office that can be found at the Broadway (Menands ) entrance to the cemetery. The burials are cross indexed by name and plot. The caretaker, during business hours, should be able from their names to locate the your parents burial plot. He can also give you a listing of who else is buried in your family plot, and their internment dates. Make a note that St Agnes Roman Catholic Cemetery shares the Broadway entrance and has a separate burial index. If your parents can't be found in ARC try St. Agnes. 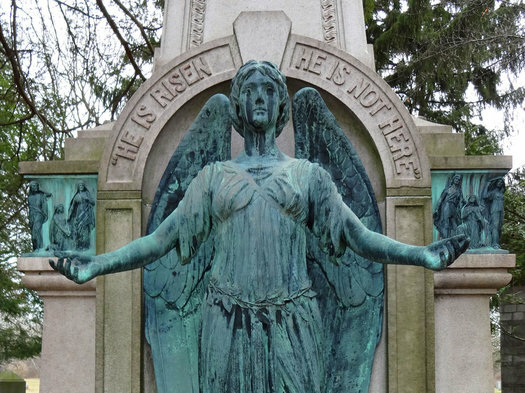 The Cemetery added a searchable database to their site a few years ago. It'll give you the section and lot number (and a pop-up map that will show you where the section is). Also, I recommend visiting the Office inside the main Broadway/Route 32 gate. They can show you a detailed map of the plot and the burial index cards. Sometimes, they have other paperwork on file for the plot - copies of deeds, etc.. I did a quick search and see the Bishops are listed for Lot 98, Section 110. Thank you so much for the tour! I find it all so fascinating I really enjoyed your interpretation of the monuments and so much appreciate your researching and sharing the history of those who passed.